CPU. I didn’t shop a CPU because it was already mounted on the motherboard. I only needed a low power processor powerful enough for home and personal usage. Memory. Nothing interesting here, the motherboard supports DDR3 1333MHz SODIMM memory, so I picked two Corsair value select modules of 4 GBs each. (The memory supports up to 16 GB of memory, which for ZFS would be better!). Disks. The disks were one of the harder choice. Ideally, SSDs would have been the perfect candidate, but there was no way I could stay in my budget unless I wanted a ridiculous amount of storage capacity. It had to be HDDs. With a fanless design, the mechanical drives became the only source of noise of the system, so I made an extensive research to find a good and silent drive. The red line from Western Digital has a 1TB drive that is as low as 21dBA (WD10EFRX), but unfortunately that is a 3.5″ disk. The “corresponding” 2.5″ model has 25dBA on paper (WD10JFCX) and is the biggest of its category (1 TB). WD RED devices are made for NAS, so I decided this could be a good choice. The amount of storage I could put into my server was limited by the space available in the case. 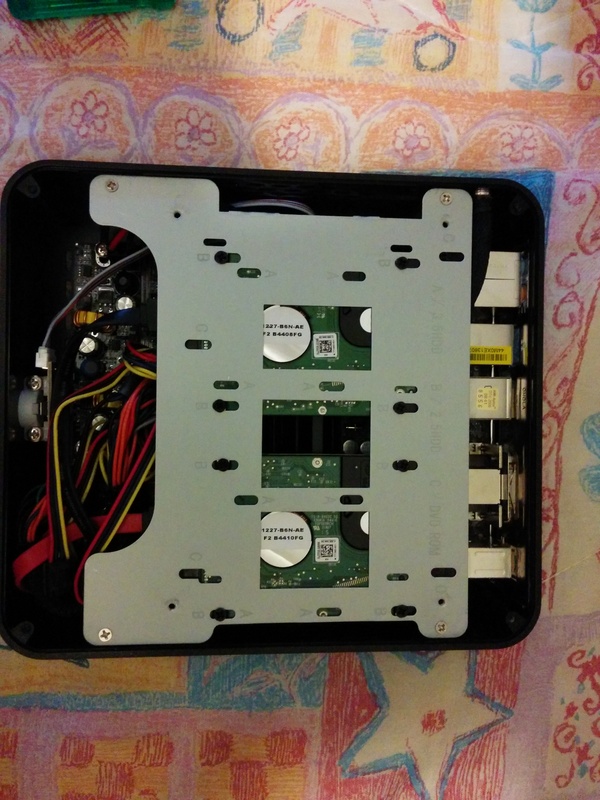 The one I chose could only contain 2×2.5″ disks, so I ordered two WD10JFCX with the idea of using them in a mirror’ed zpool. Case. 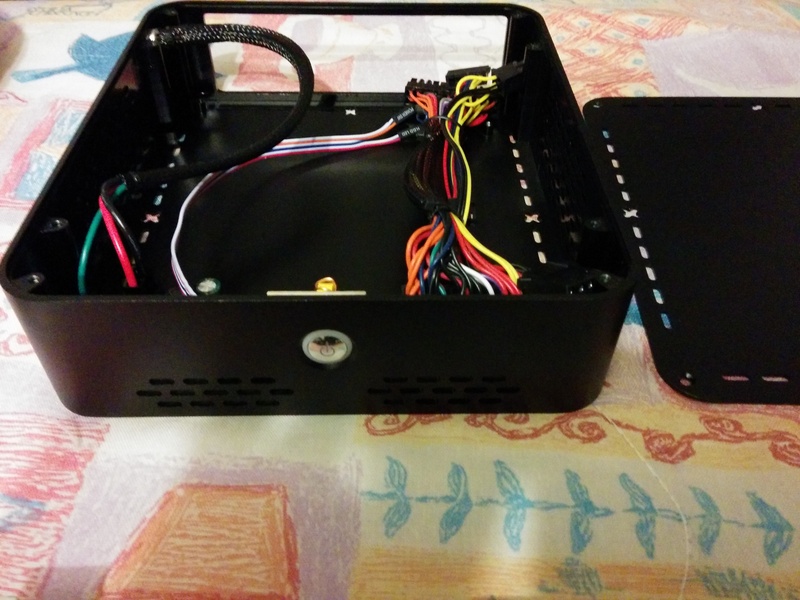 The TDP of the system is low and there are many nice mini-itx cases that include small PSUs. 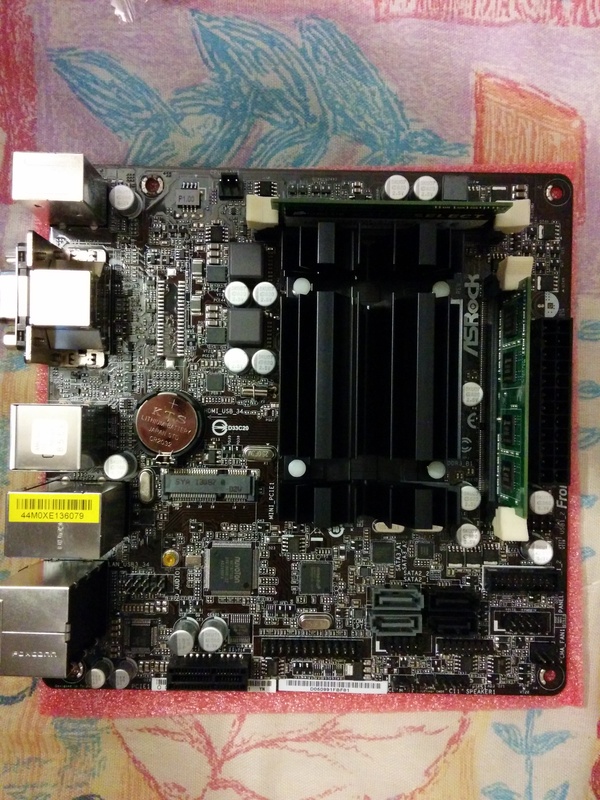 I opted for the mini ITX Q-6 from Inter-Tech, which includes a (fanless) 60W power adapter. The PSU had only one SATA power connector, so I had to buy an extra MOLEX to SATA cable for the second disk. The only problem for putting the motherboard in place was that I needed to bend the black power cable a bit to make space for the audio connectors block. In this picture I still had to put the metal plate for the connectors layout in place. The case has a support on which to hook the hard drives. The disks have to face the motherboard as this support goes really on top of the case. The space remaining between the disks and the CPU heat sink is not much. I wonder at what temperature will the disks have to operate (the cores are usually at 60-62 degrees Celsius) and if this could shorten their life. And this is the final result. The only thing missing is the 60W external power supply (like those of laptop computers), that is included with the case and that connects near the bottom-left corner. The server is currently running FreeNAS, so I have my ZFS mirrored zpool and my services running inside their Jails. I am happy about the new server, especially about FreeNAS, and I already found good uses for it (and new ones will come!). The power is certainly limited and so is the bandwidth of the home ADSL, so getting services from the outside is as slow as the upload byte-rate! The noise is not absolute zero as one can hear the hard disks spinning, but this is really a minor background factor that doesn’t disturb the quietness of the bedroom. Thanks for the complete breakdown, loved it. 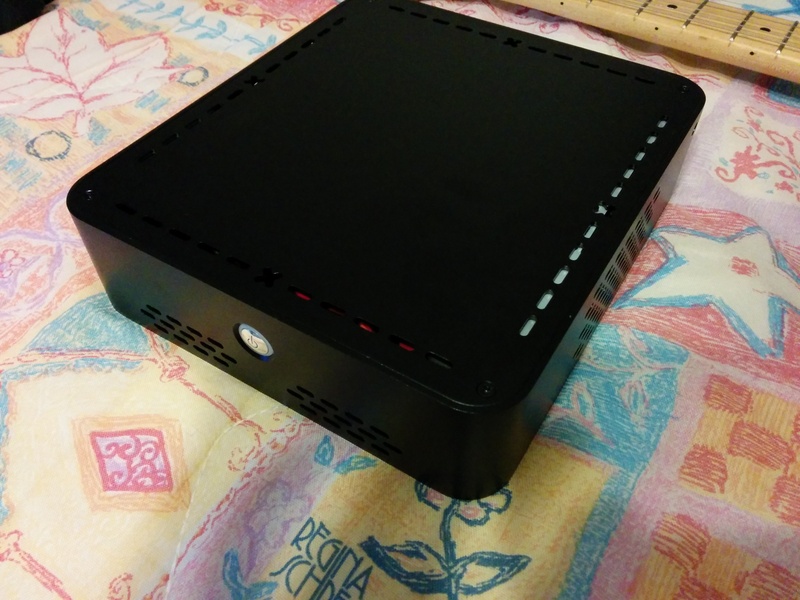 I’m intending to build a hobbyist FreeNas box at home (host movies, music, that kind of thing) and trying to make most of what I have and the money I can spend (in my country it’s a little hard to import stuff). 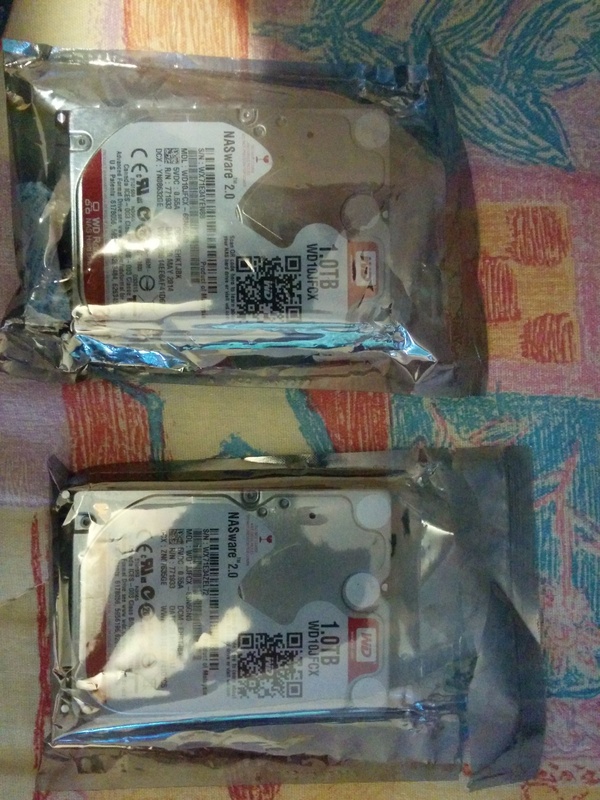 My intentions are similar to your in terms of box size (small/miniITX box,couple of 3.5 drives only). I have a PC I’m not using with a Sandy Bridge I5-2500K processor but a big ATX mother, so I planned to get a new mother but.. that’s growing fast. So I’m assessing trying to (sell this old box and) get a whole fresh thing. I can’t get the J1900 around here, will the J1800 be enough for FreeNas? How’s your box faring so far? Thanks again! Hi Charly, thanks for the appreciation :)! 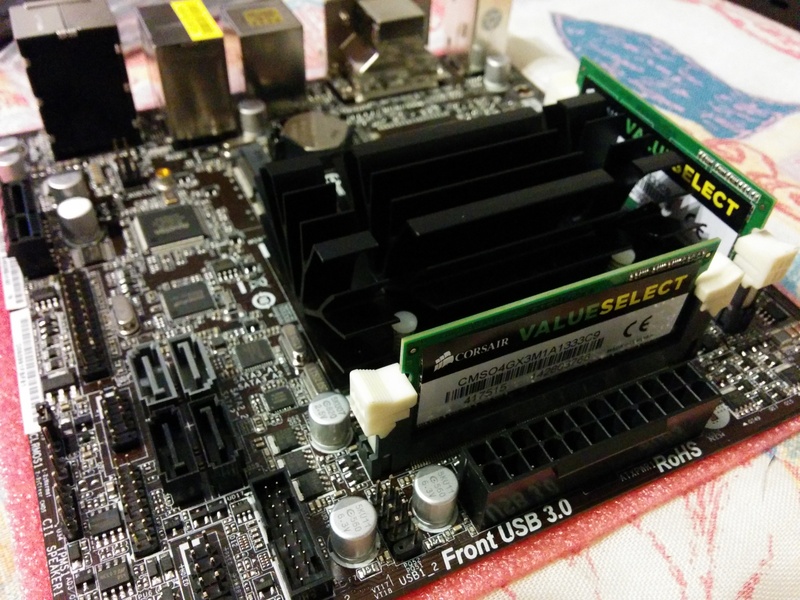 I also intended to buy the J1800 at the beginning and I changed my mind because of the ASRock Motherboard that included 4 SATA connectors instead of the usual 2 (and this shipped the J1900 CPU). I cannot even use the two extra SATA ports at the moment, but if I will change the case in the future, I can think of adding some extra disks. From a performance perspective, the biggest bottleneck is the network (e.g., when browsing pictures on the owncloud jail), but certainly when doing things on SSH or through the FreeNAS web interface, I can notice that the machine is not blazing fast. This was expected and I don’t care about it: I have to do most of the intensive operations once (except for the ZFS resilvering) and I am very happy that I sacrificed performance in favor of “greenness” :)! The server is very usable and I don’t think that replacing the J1900 with the J1800 would change much. Try to check some benchmarks :)! Hi Vince! 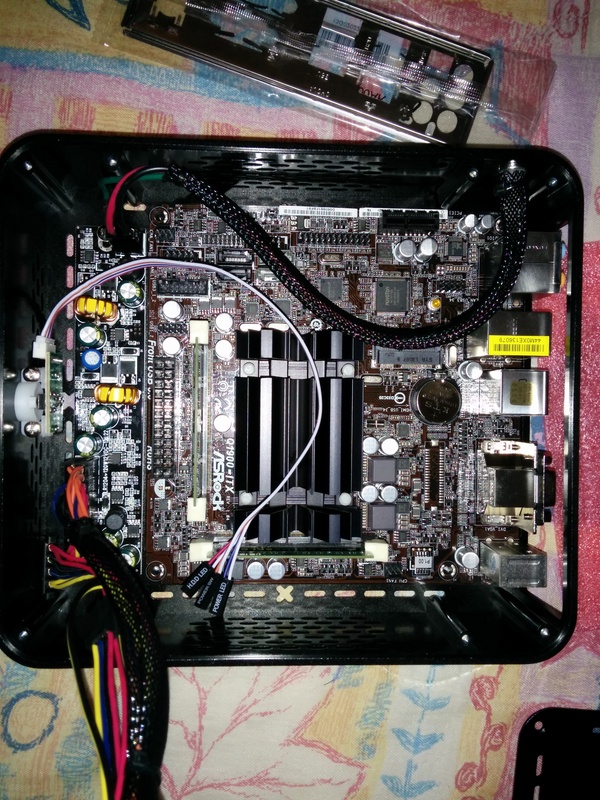 Your post serves a lot as the FreeNas forum is really tight about requirements and I’ve been trying to go places to do it with what’s available around here 🙂 Basically they say: Supermicro mother + ECC ram (non-existing here). So now I’m basically down to a couple of choices: for a box built with local parts, the J1800 (or the J1900 if I happen to get it) with normal RAM. Or.. as a friend of mine is travelling to the US see if she can get me the Supermicro (the cheaper C2550) + RAM up there (8GB ECC), which is some u$s 360 both.. It seems that FreeNas is quite tricky.. It didn’t boot up with my Sandy I5-2500K+ASUS but it DID with an AMDE350.. The say that also network *has* to be intel or at least not Realtek, maybe you could improve you great box with an Intel NIC? Anyway thanks a lot again 🙂 I’ll keep searching and let you know what I do in the end!! PS: Case & PSU will be another story itself.. Loved how you manage the 3.5″ HDDs there! I don’t think anything else could ever fit into the case :D! I also spent a lot of time to evaluate PSU and cases combination, but the form factor for me was important: with the chassis that I picked, the server is not much bigger than the router and it’s hard to notice it :). 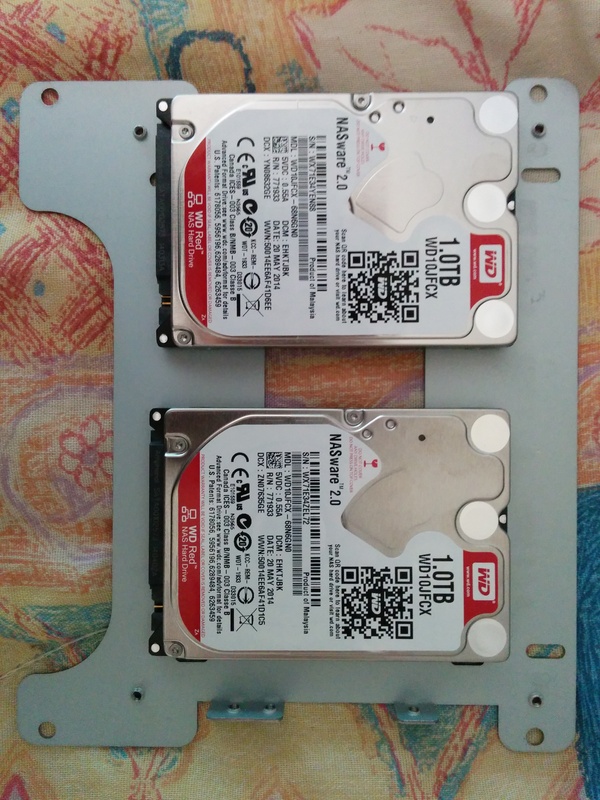 Ah, one thing, the HDDs that I put in there are 2.5″ :)! LOL you’re right they’re 2.5″.. Beauties! Can you suggest me a modify to your configuration in order to use 2 HDD 3.5”? On the same case? If you want to be able to close the top lid, there is no way. If you don’t mind leaving it open, then you can just flip the metal plate on which the HDDs are to be screwed and put the HDDs on the “external” side. If you are referring to a totally different configuration, then it is just a matter of getting a different case, the motherboard already has 4 SATA connectors (tough two of them are SATA-II and two are SATA-III). In that case you have plenty of choice. Thank you for quick reply. The Antec ISK 600 is interesting case but it is not fanless. I looking for case similar to streacom case but more cheap. Other suggests? Have you measured the power usage? No, not yet… I’d be interested to get an *external device* and do it, I haven’t looked what’s on the market yet. The AMD CPU seems to be quite high (let alone with the cooler on top). With the CPU alone I am not sure if the top lid will close (and before the lid there is the metal surface for the HDDs). Let me ask you a question: is capable of running HD movies at a stable temperature without any fan ? I want to use it as a media player for my tv, and I want 0 db noise. Thanks, so it can play HD as I expected. My concern is the heat/high temperature. I undertand that you use it 24/7 as a server, do you have any problems with high temperature ? I mean I dont want to use any fans but that case doesnt have to many airholes and without a fan I fear that all the heat will stay on the case. Yes, I use it as a 24/7 server and, no, I never had heating problems. But for the use case that I have CPU usage is quite constant, while for HD playback you would have some higher peaks. There is really not a lot of room inside the case. One option would be to leave the top lid open if you need air circulation. Ok, thanks for your fast answer. Best of wishes to you.